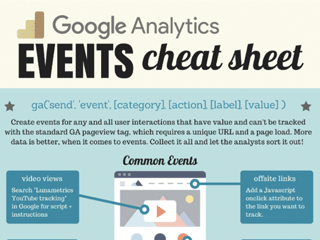 I’m presenting at the Denver Google Analytics Meetup tonight, and put together this cheat sheet on Google Analytics Events. Here’s a PDF version, and the image below links to a PNG version. Hat tip to Lunametrics for helpful scripts and being generally awesome.